C.J.’s Old Garage was a doubly quirky joint on Telegraph between Blake and Parker Streets. To be known by the name of the former business is a good start for quirk. 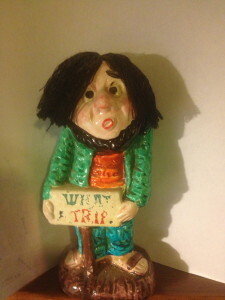 The fact that C.J.’s Old Garage was for several years in the early 1970s an indoor mall for hippie craftsmen before the era of sidewalk vendors is a second blow for quirk. Two in one! A two-fer! The space at 2566 Telegraph was a garage and car dealer from the early days of the automobile. This photo is from a 1923 edition of Pictorial California, showing the building as “University Garage” and identifying C.J. Felt (remember that name). 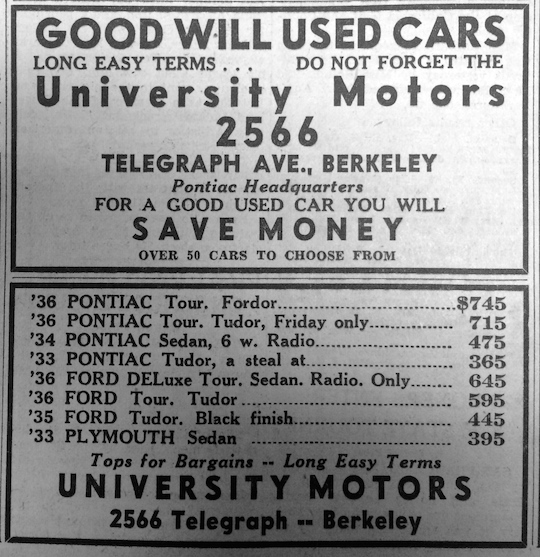 Several years later, probably in 1936, the business was renamed “University Motors” and was awarded a Pontiac dealership. In 1965, C.J. Felt and John Bolander opened C.J. 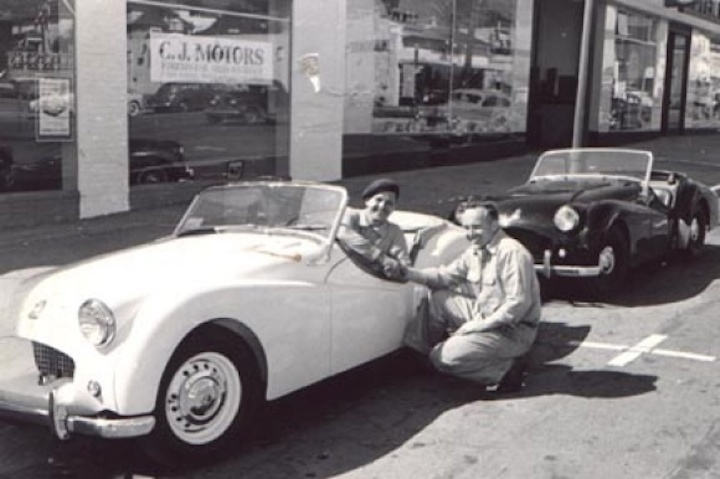 Motors, an English Ford dealer that also sold Triumph and Citroen. This was no ordinary garage or car dealer; between December 1965 and April 1966, C.J. 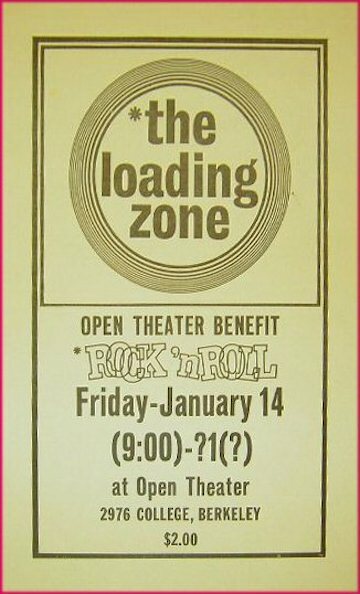 Motors was a venue for an eclectic mix of live music performances, including jazz, the Loiellet Chamber Ensemble, the Laney College Chorus, and Berkeley’s almost-famous Loading Zone. Other businesses were more ephemeral. All power to the people indeed! 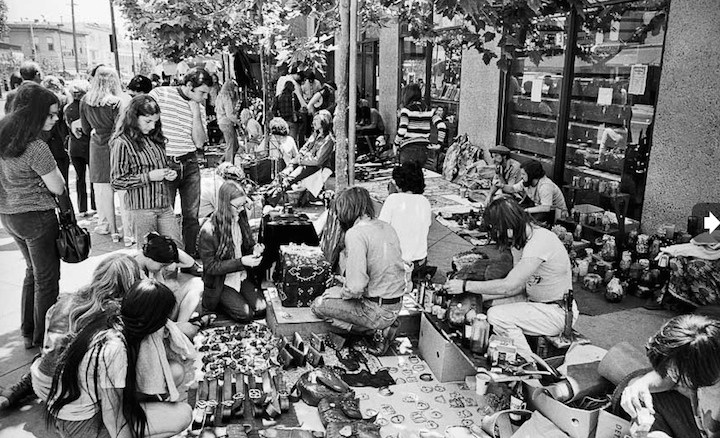 After a few years, hippie craftsmen migrated onto Telegraph Avenue. The first stop was the setback in from of Cody’s Bookstore at the corner of Haste, designed in anticipation of a swoop from Telegraph west onto Haste similar to the swoop from Dwight south onto Telegraph – a second swoop that didn’t happen. Then came the sidewalk vendors on the four-block stretch of sidewalk between Bancroft and Dwight. The building formerly known as C.J.’s Old Garage today houses The Works Cooperative Exercise and Dance Studio and in the former indoor village are a few vestigial remnants of the glory of the early 1970s. Most are restaurants – Kiraku, Kabob and Karahi, Hi Mirchii Indian Cuisine, and Fondue Fred. I showed the draft posting on C.J.’s Old Garage to my friend. He was reluctant to stop going through the latest record album collection that Gabby had gifted/dumped-on him (album covers of signers named “Slim“) but once he saw that it is about Old C.J.’s he perked right up.